Adrenalin had a longer history than most probably realise. The core was made up of a group of friends who met at high school with the band officially forming in the late seventies. Their original singer committed suicide and they also experienced being dropped by their label when its parent company collapsed. Replacement Marc Gilbert’s arrival signalled their most successful period with the release of an EP and two albums including ‘Road…’ Adrenalin became another musical casualty of the eighties primarily through a lack of promotion. 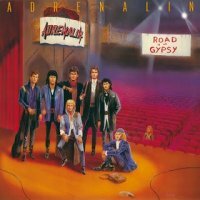 ‘Road…’ is wall to wall eighties AOR/American Driving Rock. The hallowed title track, which featured in the eighties film ‘Iron Eagle’, leads things off and I think it is still as beautiful a song today as when I first heard it in the film. For those unfamiliar with it, ‘Road…’ is a mid paced mellow rocker with some heartfelt lyrics delivered with passion by Gilbert. A couple of other tracks stick to the same lower mid pace such as ‘Kids Got A Will To Live’ and ‘Michael’. The rest all have a slightly increased tempo about them in comparison. The pick of these includes ‘Northern Shore’, ‘Faraway Eyes’ and ‘Photograph (Time Passes On)’. ‘Summer Nights’ also fits in this higher speed arena and is a proper summer time driving song with some of Gilbert’s best vocals. This is a solid slab of classic sounding eighties AOR. It isn’t earth shattering or a classic even in its own genre but neither is it a waste of effort. Musically it is very much of its time with lots of keys and saxophone, where the later often combines with the guitar for solos. Whether it transfers well into 2013 really depends on your tastes. It does sound dated next to today’s recordings, so if you have a modern palette, the answer is probably no. But when compared with like for like, it’s above average without being outstanding. For those unfamiliar with Adrenalin you should be thinking of the likes of Toto and Foreigner. ‘Road…’ does have a couple of negatives however. Firstly, although there is a scale of pace, it is not a large gulf between each end, meaning the tracks have a similarity. A little more variety would have helped lift this album to a higher echelon. The production is also not the best with everything sounding far too polished and fat. The drums have a very synthetic machine sound to them despite there being a proper drummer. To me this type of production is synonymous with the time and actually reasonably forgivable. Perhaps the biggest knock is that it is a fudge job that’s virtually a repeat of the previous album. Six tracks from ‘American Heart’ feature on ‘Road…’ with just three ‘new’ tracks; if you have that there really is only the title track to get your teeth into. For those without ‘American Heart’, this is a fun but unspectacular sample of eighties melodic rock that will be enjoyed by those most into the genre.